Now that October is around the corner, it’s a great time to preview the next lot of trends coming your way. It’s always good to be a little bit ahead of the sartorial curve when it comes to integrating key trends into your closet. As with every year, there’s something for everyone, these are just the ones that have taken my fancy. Remember that you don’t have to fill your closet with trends; just choose the one that best suit your personality and gorgeous shape. Crushed velvet in various jewel tones set the stage to give your fall style a luxe romantic feel. The lush texture and feel plus the visual allure of velvet give your fall/winter ensembles a magnetic appeal. Worn for daytime or evening, velvet is a statement all its own. 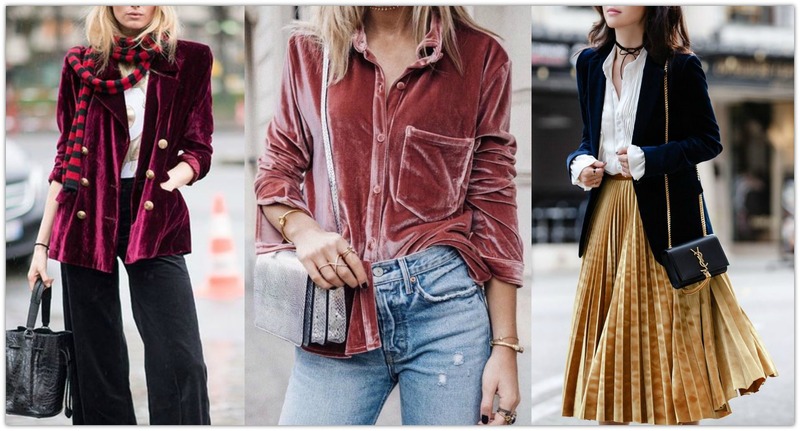 Contrast the luxe feel with casual pieces or play up the luxurious feel of velvet and pair it up with high-fashion accessories. 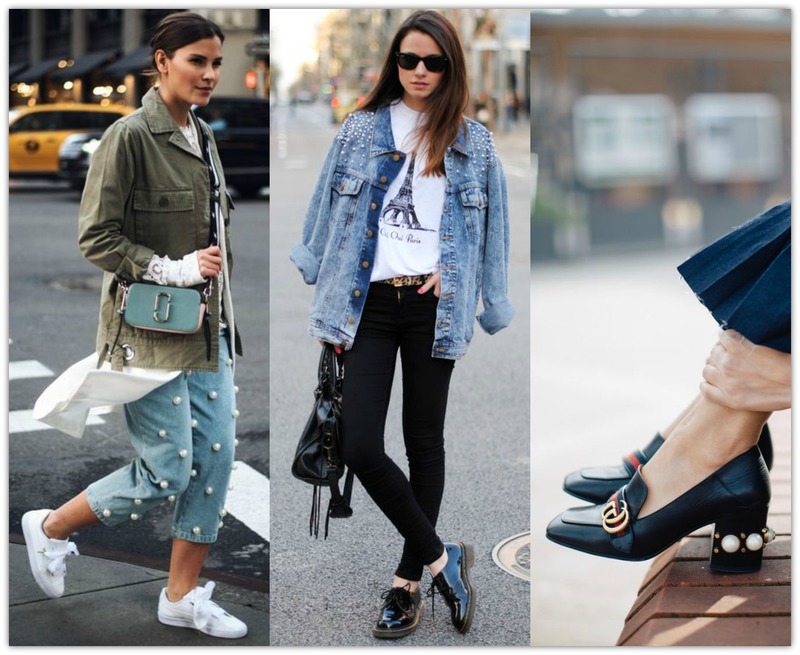 Corporate style has spilled over to the fashion trend hemisphere in a big way. 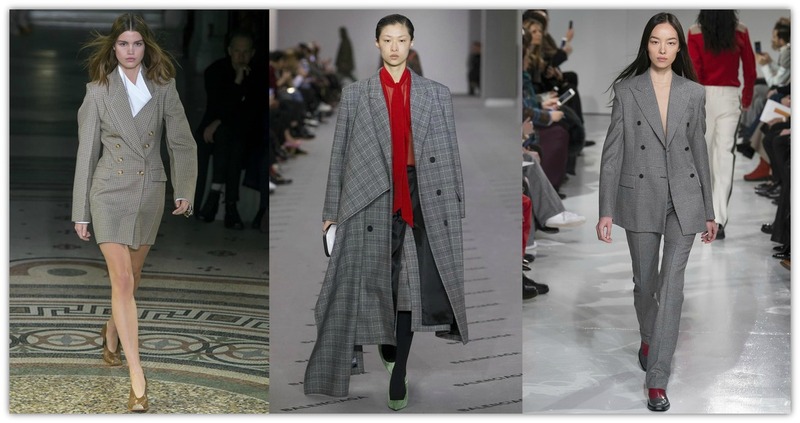 Pantsuits and double-breasted jackets moved from the boardroom to the runway this season. You’ll see them mainly in hues of grey and subtle pinstripe/check patterns and oversized silhouettes. 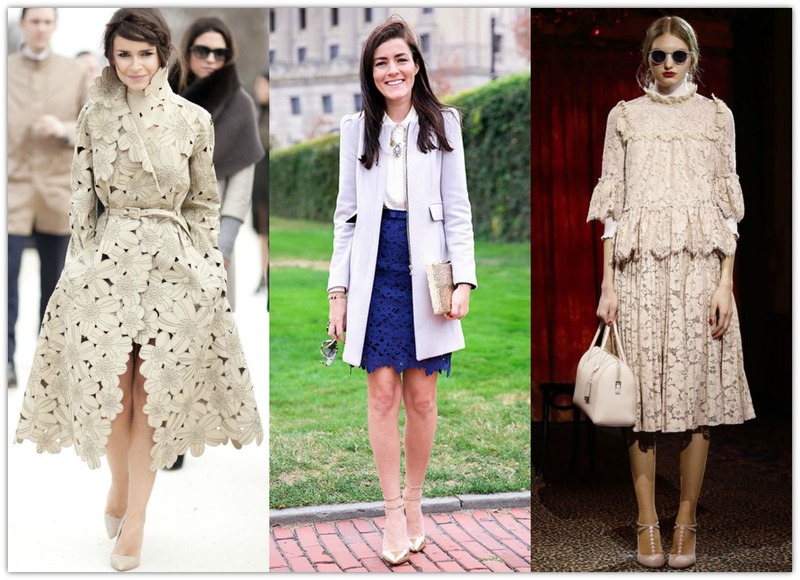 To successfully pull off the trend incorporate some feminine touches like bow-tie blouses or wear with sleek trousers. Less gossamer and flowing, this seasons lace is more about structure and details, pattern and texture. Cutwork lace is more prevalent than the sheer lace kind. Designers really want you to revel in, and appreciate the intricate lace patterns and use them as a focal point for your outfits. You can even try a lace on lace outfit! Oh, and don’t discount lighter coloured laces for the season. As has been proven over time, blush tones aren’t just for the spring and summer. This year it’s on-trend to wear pastel-hued cutwork lace for the colder months – it’s practically de rigueur. If you’d prefer to be bolder with your lace, try red or navy lace on for size. Pair your lace items with fall staples like leather jackets and chunky knits. Girls in pearls are classy and elegant. This winter you can inject some sophistication into your casual, everyday pieces with pearl embellishments. You’ll find the pearls mainly on denim clothing and knitwear. Every season there’s always a color that rises to the top of the trend radar. This winter, red is the ‘it’ color of this season. Though the temperature might be cooling, red really turns the heat up and makes sure you and your style never go unnoticed. 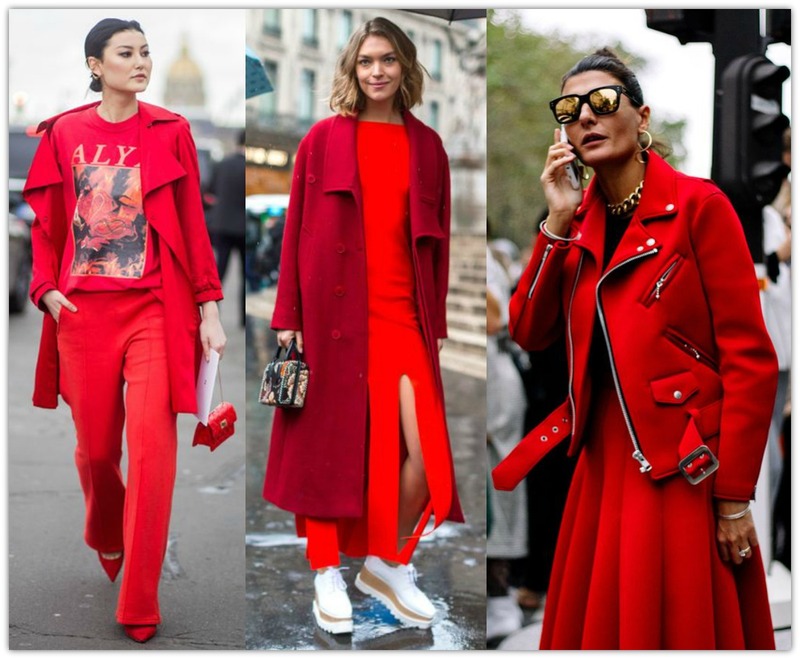 Going monochromatic in varying hues of red is your best bet in unlocking the power of this color trend. 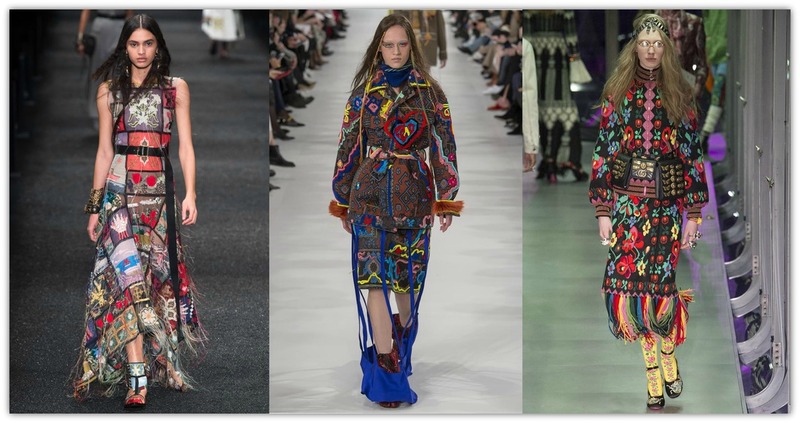 Inspired by the folkloric arts and crafts movement, the runways were awash in patchwork and colourful tapestry-like textures. Combining elements of quilting, fringe, and embroidery may seem like a lot, but this trend is perfect for creative boho gals. Don’t get intimidated by the art influence of this trend, it’s all about finding a piece that speaks to you and that you love. This look is best worn with straight hair and a minimal makeup. 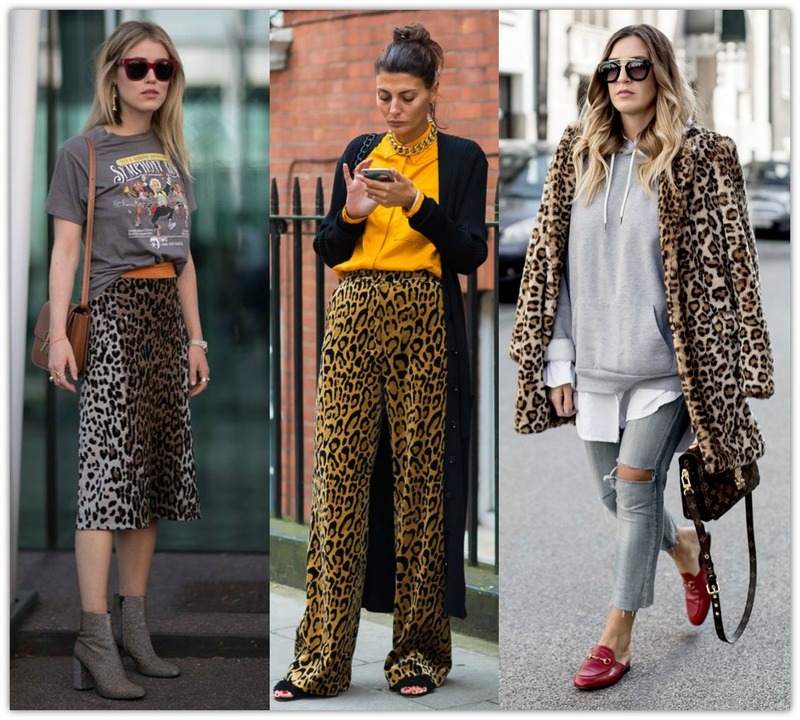 Leopard prints will be everywhere, this time around though, leopard print is more in-your-face and paired with larger-than-life pieces. Play up the drama of this animal print by being bold and wearing it with sportswear, bright yellow, and statement band tees. I love the corporate chic style, it looks so good and stylish. these are great winter outfit ideas. Thanks for posting this.